BBC News reporter Katy Glassborow is on board the JDS Kashima, one of a host of international ships taking part in the Trafalgar 200 celebrations. Nelson's victory may have had an immense impact in Europe, but it is not until you see the representatives from navies around the world converging on Portsmouth that you understand how profoundly his influence is felt worldwide. The JDS Kashima which arrived on Friday is one of three training ships in the Japanese navy. Takahiro Saito, 25, a trainee officer from Tokyo aboard the ship, said: "As part of our training we learn about Nelson and the Battle of Trafalgar. "There is even a portrait of him in our naval academy. We respect his strong sense of responsibility." The ship has sailed for five days to reach Portsmouth and represent her country in front of the Queen in a multinational arena. Takahiro said: "It is an honour to be part of the Fleet Review and visit the UK, which has a long maritime history. 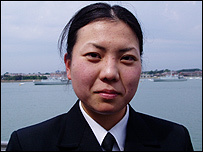 Nami Matsue, 23, is one of 21 female officers aboard the Japanese ship. 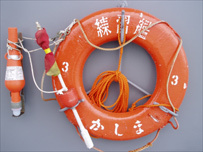 She said: "When I was a child I saw the statue of our navy hero Ryoma Sakamoto gazing out over the ocean. "His eyes were not looking inside Japan, but out at the world. International diplomacy is a large aspect of what navies do." Commanding Officer of JDS Kashima, Captain Mukai, said: "The Japanese Navy have learned a great deal from the Royal Navy and enjoy a friendly alliance with the United Kingdom. "It means a great deal for us to be part of this event." Admiral Jonathan Band, visiting from HMS Endurance, commented: "The Royal Navy helped set up the Japanese Navy 100 years ago. "There is a huge heritage link there, in fact one of their training colleges is an exact replica of Dartmouth. "Trafalgar 200 is important internationally. It celebrates the fact that mariners are a great club of people who have a joint respect for the sea." "There is no greater connecting medium in the world than the ocean, and it unites us," said Admiral Band. Are you up to our schoolchildren's challenge? Were they one of Nelson's men?